Madcap Scottish craft brewers, BrewDog, has launched a “protest beer” aimed at Vladimir Putin and Russia’s laws on homosexuality. 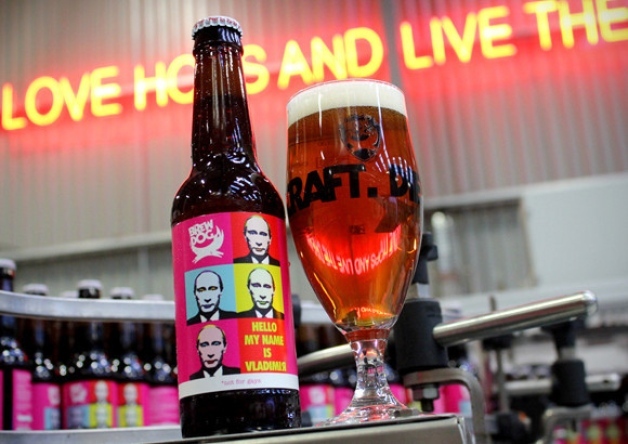 “Hello My Name is Vladimir Putin” is an 8.2% double IPA with Russian limonnik berries and, according to the label, “traces of sarcasm”. The label features an Andy Warhol inspired collage of Putin’s face wearing make-up and is clearly marked “not for gays”. Co-founder James Watt explained: “As ‘Hello My Name is Vladimir’ is clearly marked ‘not for gays’ we should bypass the legislation introduced by Putin outlawing supposed ‘homosexual propaganda’ so Vlad shouldn’t have an issue with it. The brewer has said that it will donate 50% of profits from the beer’s sale to charities that support oppressed minorities around the world.